The two significant things that relates to the island of Rameshwaram are Ramayana and the engineering wonder, Pamban bridge. Located along coastal Tamil Nadu, Rameshwaram lies adjacent to Dhanushkodi which is geographically the closest Indian destination to Sri Lanka, separated by the Gulf of Mannar. Rameshwaram is a prominent religious centre and is deeply connected with Ramayana as it is believed that Rama and his army crossed over from here to Sri Lanka. The temple town is also known for Ramanathaswamy temple dedicated to Shiva. Apart from the mythological aspects, the splendid sea and spectacular sunsets are absolutely alluring in this small island. Expanded during the 12th century by the Pandya kings, Ramanathaswamy temple has a shivling as the main shrine which is believed to have been consecrated by Rama upon his return from Sri Lanka. It is one of the twelve Jyotirlinga temples in the country and houses the longest temple corridor in India which is lined with more than a thousand pillars and colourful ceilings. The temple is also known for its 22 theerthams (holy ponds) where pilgrims queue up to be watered by priests and move from one well to another. It is believed to be auspicious to have a bath from the waters of all the wells before entering the inner sanctum of the temple. The temple has four large gopurams (entrance gates) of which the eastern gate is the tallest (173 feet) and has tall walls surrounding it. The lanes around the temple sell myriad things from temple paraphernalia to sea shells to curios. Also known as holy ponds, there are 64 Theerthams present across the town of Rameshwaram. The most popular one is Agnitheertham, which is actually the shallow stretch of sea behind Ramanathaswamy temple. Almost all the pilgrims take a dip here prior to their visit to the temple. Ramar theertham was where Rama took a dip and there is a Rama temple next to it. The gorgeous Lakshmana theertham is where Lakshmana took a dip to cleanse off his sins and installed a shivlinga. Villondi theertham stretches into the sea and it is believed that Rama shot an arrow into the sea to create this pond to quench the thirst of Sita. Some of the other popular holy ponds are Mangala theertham, Runa Vimochana theertham, Jambhavan theertham, Sugriva theertham and Jata Mukuta theertham. A couple of them such as Angad theertham have become a source of water for the locals. This hillock is the highest point in Rameshwaram and is also believed to house the foot prints Of Rama. The upper storey of the temple offers magnificent aerial views of the green surroundings, the sea and the tall gopurams of Ramanathaswamy temple in the distance. Located between Ramar theertham and Laskhmana theertham, this shrine of Hanuman has five faces and is one of the popular temples in Rameshwaram. There is also a display of floating stones from Ram sethu inside the temple. Photography is prohibited inside the premises. Located enroute Dhanushkodi, Kodandarama swamy temple stretches out into the backwaters of Bay of Bengal. A long narrow road leads to this scenic temple which houses the shrine of Rama. It is believed that this is the place where Rama and his army met Vibheeshana (Ravana’s brother) in Ramayana. The inside walls of the temple depicts this part of the story in the form of paintings. The surrounding area is an apt place to spot avian fauna. Dedicated to the former President of India and renowned scientist, A P J Abdul Kalam, this memorial houses a huge collection of photographs, portraits, life size wax statues and various awards that he had received apart from his personal belongings. It also displays stories from his childhood, his youth, the days as a scientist at DRDO and his tenure as the President of the country. The memorial is a tribute to this great soul and his mortal remains are also kept here. A P J Abdul Kalam was born in Rameshwaram and spent his younger days in this island town. Photography is prohibited inside the premise. One of the engineering marvels in the country, this 2.3 km long Sea Bridge connects Mandapam on mainland India with Pamban, a small hamlet in Rameshwaram. Built in 1914 CE, this rail bridge is a cantilevered one which is sometimes raised to let large ships pass through. Running parallel to this is the road bridge which is known as Annai Indira Gandhi bridge. The road bridge offers panoramic views of the rail bridge, endless stretch of blue sea, innumerable moored boats and spectacular sunsets. It is a delight to walk over the bridge to enjoy the sunset as the sky splashes a riot of colours from golden to orange to red to pink to brown to mauve. Rameshwaram is 170 Kms from Madurai, the nearest city. Though the nearest airport is at Madurai, Rameshwaram has a railway station and has regular connecting trains to Madurai and Chennai. There are frequent buses from Madurai to Rameshwaram. The town has numerous restaurants offering a wide range of vegetarian cuisines. It is quite tough to get meat dishes in Rameshwaram. Rameshwaram has many hotels from budget range to the luxurious ones. The two kilometer long Pamban bridge connects the tip of mainland India with Rameshwaram and Dhanushkodi. This bridge offers spectacular sunset views as the evening sky splashes lovely colours. Rameshwaram, Tamil Nadu. March 2018. Fishing boats moored along the coast of Rameshwaram, Tamil Nadu. March 2018. During my sojourn at Madurai, every day apparently started with a visit to the magnificent Meenakshi temple and ended eventually at the same place. It wasn’t just about the temple, but also its surroundings and liveliness of the streets. A stroll through its circumambulatory streets offered a significant insight into the life around the temple, which supposedly hasn’t changed much since the temple gained prominence during the rule of Pandyas. Lined with shops selling a plethora of items from fabrics to utensils to temple paraphernalia to artefacts, there is no end to the amount of glee that a shopper can feel. The hustling crowd and the tall colourful gopurams further accentuates the charm of this place. Though the city has grown over the years, Madurai still exudes the charm of yesteryears and is very rightly crowned the cultural capital of Tamil Nadu. The capital of Pandya dynasty between 7th and 13th centuries, Madurai beside the river Vaigai is one of the oldest cities in the country. During the times of Pandyas, Madurai is said to have had trade links with China and Rome which resulted in the growth of the city. The city was also ruled by the Nayak dynasty during 16th and 17th centuries. The city further expanded as the Meenakshi temple gained popularity and settlements grew around it. It is also believed that Tamil Sangams (conference of writers and poets during the olden times) were held here. The city is also known for its celebrations and festivals such as Jalli Kattu in January and Chithirai in April. All these make Madurai the most popular temple town and the heart of Tamil Nadu. Meenakshi Amman temple also referred as Meenakshi Sundareshwarar temple is the cynosure of all eyes who visits Madurai. Built by the Pandya rulers in 7th century and then added on by the later kings, Meenakshi temple is one of the prominent temples in the country. The colourful and intimidating gopurams of the temple can be seen from a long distance. The surrounding tall walls act like a fort with numerous stalls and shops selling myriad things lined up outside it. It is a delight to walk through the streets outside the walls to have a glimpse of the life surrounding the temple. Dedicated to Parvati who is worshipped in the form of Meenakshi, the temple also has a huge shrine of Sundareshwarar, a form of Shiva. There are also other shrines of Subrahmanya and Vinayagar. Apart from the deities, the temple is also known for its marvelous architecture, sculptures and carvings which are present across. The four rajagopurams (main entrance gates) are adorned with sculptures of various figurines and gods from mythology. The north entrance has paintings on its ceilings, elaborate carvings on its façade and has a line of well carved pillars. Apart from these gopurams there are ten more towers within the temple premise. While the smaller gopurams further lead to the inner sanctum, the main shrines of Meenakshi Amman and Sundareshwarar have gold plated towers above them. At the entrance of the Sundareshwarar shrine are stunning sculptures on pillars of various mythological characters. 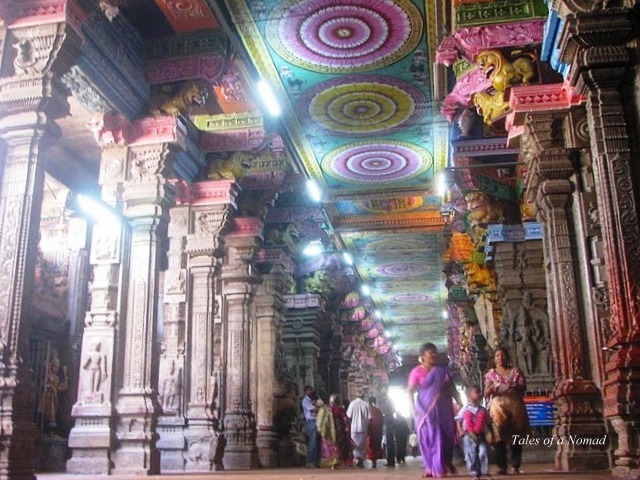 The temple has quite a number of mandapams (halls) which have beautiful art works in the form of sculpted pillars. Mudali Pillai mandapam, Oonjal mandapam, Kalyana Sannithi, Kambathadi mandapam are some of these with magnificent sculptures and art works. Aayiram Kal mandapam or Thousand Pillar hall is the most prominent hall here which has a thousand pillars and gorgeous sculptures adorning it. It also has a collection of artefacts from the bygone era and is now a museum. The large temple pond which is known as Pottramarai kulam is the other interesting attraction here. When the Nayaks ruled Madurai between 16th and 17th centuries, Thirumalai Nayak built the grand Thirumalai Nayak palace in 1636 CE. With a blend of both European and Dravidian architecture, the palace is known for its numerous pillars with beautiful arches atop them. The large courtyard in the centre is surrounded by pillared corridors. Above the arches and on the ceiling are gorgeous art works and carvings. The palace also houses a museum. Gandhi Memorial museum is a large white coloured structure that houses the personal belongings of Mahatma Gandhi (including the blood stained cloth worn by him at the time of his assassination), photographs from the times of British rule, history and write ups regarding various events during the time of independence. The museum was earlier the palace of Rani Mangammal during the rule of Nayaks. Mariamman Theppakulam is a large temple tank built in 1636 CE by Thirumalai Nayak. 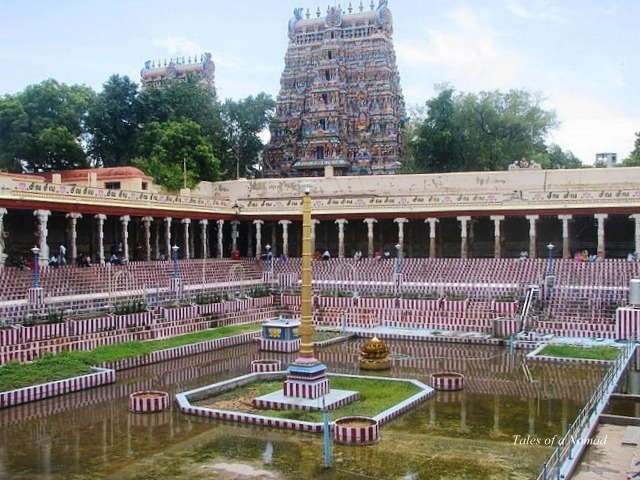 Believed to be the largest temple pond in Tamil Nadu, it has a Mariamman temple located at its centre. The float festival held here in January is special and the tank is is filled with water during that period. During the summer months, it usually becomes a playground for the local children. Situated in the outskirts of Madurai, Thirupparakundram temple is one of the popular temples near Madurai. It is one of the prominent temples dedicated to Subramanya and is also believed that he married Devayani here, making it a favourite temple for people to tie the knot. This ancient cave temple has wonderful carved pillars in its entrance hall and in the inner halls that lead to the sanctum sanctorum. There are also quite a few beautiful sculptures of various mythological characters across the halls. Though the cave temple has mentions since the Sangam age (3 CE), the present structure was built in the 8th century by Pandya kings and the further added by the Nayaks in 16th century. The road that circumambulates the large hillock inside which the Thiruparakundram temple is situated, leads to a couple of Jain shrines which have been present since 3 BC. The caves which are believed to have been homes to Jain monks have stone carvings and engravings inside them. Keezhakuyilkudi located a few kilometers outside Madurai is home to another jain cave with carvings of Mahavira. The cave is located on Samnar hills which offer beautiful views of the setting sun. At the base of the hill is a Hindu temple with another one on top with a long flight of steps leading to it. While in Madurai, two things one shouldn’t miss are Murugan’s Idli and Jigarthanda. Murugan’s Idli shop is a cult place and offers delicious spongy Idlis dipped in oil. Spread on a banana leaf with a chutneys and sambhar, these are sure to melt in your mouth. Jigarthanda is a thick drink made from ice cream, milk, cream and a lot more. It is quite popular across Madurai and is well recommended during summers to reduce body heat. 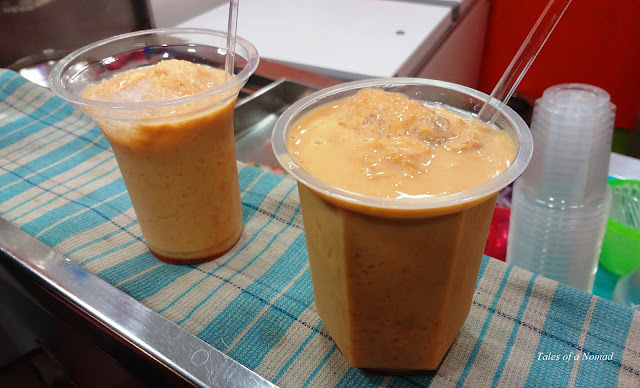 Famous, a small outlet which has been offering Jigarthanda since 1977 is the best place to relish this. Both Murugan’s Idli and Famous are located near Meenakshi temple. Mobiles and cameras aren’t allowed inside Meenakshi temple and have to be deposited at the counters outside the temple. The streets around Meenakshi temple remain alive quite late into the evening. Be watchful while visiting Keezhakuyilkudi jain shrine as the place remains deserted and devoid of visitors always. Madurai is well connected to other parts of Tamil Nadu and all major cities of southern India. Madurai is 462 Kms from Chennai, 130 Kms from Tiruchirappalli and 435 Kms from Bangalore. There are regular trains and flights from Madurai to all parts of India. Frequent bus services ply from Chennai, Bangalore, Coimbatore and Tiruchirappalli to Madurai. There are numerous eateries and restaurants across Madurai and around Meenakshi temple. While most of them are vegetarian restaurants, there are places which serve non- vegetarian food too. Murugan Idli shop is a must visit place for breakfast to devour some soft idlis. Being a large city, Madurai offers a wide range of options to stay from budget to luxury hotels. I stayed at The Lost Hostel which is well recommended.